When Chusak Suvimolstien left Bangkok for Assam, a state in the eastern part of India bordering on Myanmar, he never imagined the surprises that would be in store for him. A Thai Buddhist, he had just left an important job as an instructor at the Huachiew Chalermprakiet in Bangkok and decided to plunge into research. He had heard about the Tai people and especially of the Tai-Ahoms of Assam, from several academic sources and therefore wanted to do research on them. What Chusak experienced after staying and interacting with the Tai people in Assam was very profound. According to him, the Tais of Assam belong to the same ethnic stock as the Thais, and in one way are their lost brothers or cousins. Chusak visits with a village elder. A long way back in history, the Tai-Ahoms had migrated from Yunnan in China to Burma and finally migrated westwards into the Brahmaputra Valley located in the eastern part of India. In the year 1215, Sukapha, the leader of the Ahoms, along with his followers left Maulung in Upper Burma and after defeating several tribes on the way, entered the Brahmaputra Valley in the year 1228. Sukapha founded the Ahom Kingdom, which lasted for more than six hundred years. During the early period of Ahom rule, there continued intermittent flows of small migrant groups of Tai origin into the Ahom Kingdom. The later Tai migrants were mostly Buddhist. The Ahoms were able to develop a new civil society based on equality of all the tribes living in the Brahmaputra valley. This new identity was Assamese, which also developed a distinct language. The Ahoms assimilated and patronized the new identity and the Assamese language. 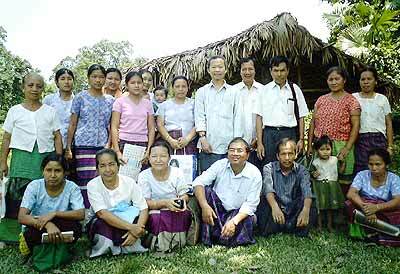 In the process, the majority of the Ahoms forgot their ancestral language. 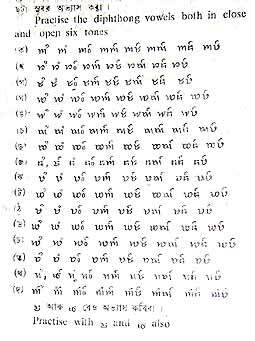 However, the priests of the Ahoms preserved the original Tai language and this is what scholars like Chusak find so interesting. The Ahom kingdom was only overthrown after the advent of the British colonial masters as per provisions of the Treaty of Yandaboo signed on 24 February 1826. The Assam alphabet somewhat resembles the Thai alphabet of today. However, under the colonial rule, the Royalty disintegrated and the British cultivated a new and privileged middle-class and bureaucracy. The British did not have much confidence in the Ahoms, as they initially struggled hard to regain their lost independence. This marginalized the Ahoms and diminished their power. This marginalization of the Ahoms fit perfectly into the well-known British policy of ‘divide and rule’. Thus a new elite developed in colonial Assam, which largely excluded the Ahoms. This same elite largely dominated the polity and the socio-economic and cultural domains of Assam even in the post independent period of the country. Ahom consciousness of a distinct identity developed during British rule. It also led to political mobilization with the formation of the All Assam Ahom Association in 1893, which was later named as the Ahom Sabha. In a significant speech, one of the presidents of Ahom Sabha, Surendranath Buragohain stated, “It is a great fortune on the part of the Indian Union that the great Tai family people have been within India. The Indian Government can utilise this force as a medium to establish friendship between India and Eastern Asia.” However, this was not heeded to both before and after independence of India. With the dawn of the new millennium and the increasing demands of globalization coupled with the demand created upon the opinion built up by academicians, intellectuals and the people of Assam demanding opening of the eastern borders, the situation has begun to change. One should never lose sight of the fact that the peoples of North East India are predominantly mongoloid and there are several groups of Tais, like the Tai-Phake, Tai Turung, and the Tai-Ahoms. Chusak lived amongst these people and was exhilarated by some similarities. The names of several rivers and places of Assam in Tai language remind us of their cultural background. Nam means water, as kai means chicken in their traditional language. Chusak feels that it was western imperialism that divided these peoples and that it is time to build bridges between them. “There are lots of linkages and one needs only to use them to strengthen the ties,” he feels. He further opines that places like Chiang Mai and Chiang Rai are closer to Assam than other places in the region. One can feel the optimism in the air as there is the new Look East Policy adopted by the Government of India. The ASEAN car rally held in 2004, linking up Guwahati, the premier city of North East India, with the other centers of SE Asia marked a new beginning. One can definitely hope that in the coming days there will be closer ties between the people of Assam and this region, including Thailand. Perhaps there would also be more projects like the Thai-Yunnan Project, which was done in the late 1990s jointly by Chulalongkorn University and the Australian National University. Perhaps, the dream of Chusak to travel by public transport all the way from Bangkok to Assam via Chiang Mai and Burma will be accomplished one day. One can only pray that sooner is the better. Chusak (4th from right) standing with a group of Tai Phake villagers. 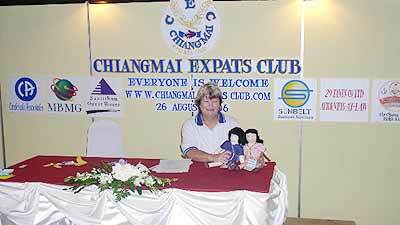 The Chiang Mai Expats Club (CEC) is growing, growing, growing! The well-attended meeting was held on Saturday, August 26, 2006, at 10:30 a.m. at the Chiang Mai Orchid Hotel on Huay Kaew Road. Just over 100 members attended the double feature presentation as Jim Cox, founding president and board member introduced 15 newly joined members who hail from all over the globe. Thatsawan (Yai) Napikun giving short lesson on how not to speak Thai. What is really fascinating is that club members’ ages run the gamut, anywhere from thirty-something to seventy-something. So many members seem to have so many things in common, such as current or former occupations, recreational or social interests, hobbies, etc. To say the least, CEC is not an organisation filled with ‘couch potatoes’ or do-nothing retirees. These folks are vibrant and active and willing to get involved in Chiang Mai happenings. Since the club started in September, 2005, membership has grown to well over 200 members, and the occasion will be celebrated at the September 23, 2006 anniversary meeting to be held at 10:30 a.m. at the Orchid Hotel. Special treats are in store for those who stop by to join in the momentous occasion. You won’t want to miss this meeting. The list of CEC friendly merchants and club sponsors also keeps growing each month. Friendly merchants and sponsors offer discounts to those who show their membership card when receiving services at local Chiang Mai business establishments. Sentoria Blackwood, a spokesperson and volunteer with Australian Business Volunteers (ABV) works with WEAVE, an organisation ‘founded in 1990, with the intent to empower indigenous women and support their needs and basic human rights’. WEAVE is an acronym for Women’s Advancement and Empowerment Via Education. 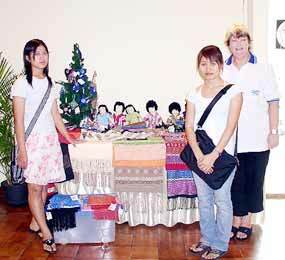 Women from the WEAVE program displaying handcrafts. Using her slide presentation and display of crafts made by women involved in the WEAVE program, Sentoria shared information on how women along the Thai-Burmese border are working toward self-sufficiency, while assuming leadership roles in their communities and villages. Women in the program learn valuable work skills which provide income with which they are able to help support their families. WEAVE also has a child development component which incorporates special education and assistance to children with special needs. Thatsawan (Yai) Napikun, owner and teacher at Easy Study Thai Language School brought her classroom to the expats club meeting and delivered a ‘hands-on’ lesson on “How Not To Speak Thai”. Using a power-point presentation, Yai demonstrated proper Thai language conversational vocabulary and word pronunciation, and exhibited correct Thai language sentence structure, while at the same time working her audience into her presentation by having them repeat words and sentences. Remember, the month of September has five Saturdays, and since expats club meetings are held on the second and fourth Saturdays each month, the next regular meeting will be on September 9. Please mark the date on your calendars. Remember, it all about expats helping expats. Sentoria Blackwood displaying dolls made by women in the WEAVE program. 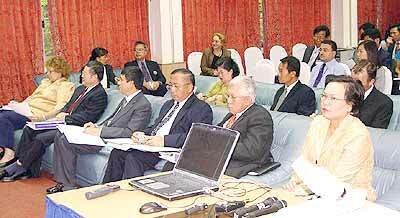 The official launch ceremony of the Regional Training Programme to Combat Human Trafficking in the Greater Mekong Sub-region (GMS) was held at the Mekong Institute (MI) on the campus of Khon Kaen University on 28 August 2006. 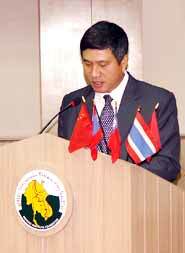 Speaking on behalf of the GMS embassies, the Ambassador of the Socialist Republic of Vietnam, His Excellency Nguyen Duy Hung, expressed satisfaction on the progress currently made in the region to combat human trafficking. The Regional Training Programme is the first project under the COMMIT (Coordinated Mekong Ministerial Initiative Against Trafficking) Sub-regional Plan of Action organised by the UN-Inter Agency Project on Human Trafficking in the Greater Mekong Sub-region (UNIAP), who was appointed by the GMS governments as the Secretariat, and the MI. 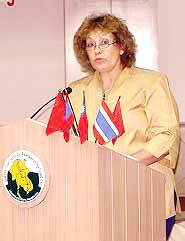 Ms. Joana Merlin-Scholtes, UN Resident Coordinator in Thailand, is seen delivering her keynote speech to the participants from the six GMS countries at the Mekong Institute in Khon Kaen, Thailand. Speaking on behalf of the GMS embassies, the Ambassador of the Socialist Republic of Vietnam, His Excellency Mr. Nguyen Duy Hung expressed satisfaction on the progress currently made in the region to combat human trafficking but emphasised the need to do much more to make a difference. A key feature of the programme is the opportunity for participants to meet colleagues from neighbouring countries, to share information and to build trust and relationships that will become important in fighting the crime of human trafficking in the region. Ambassadors and senior officials from the Embassy of Cambodia, China, Lao PDR, Myanmar and Vietnam, senior officials of the Royal Thai Government, UN representatives, development partners from the Embassy of Sweden and the CIDA-funded SEARCH project were present on the occasion to commemorate the official launch of the highly regarded Regional Training Programme. Altogether 29 middle to senior level government officials and International Non-government Organisations (INGOs) personnel from all six GMS countries will be attending this fourth training session from 28 August to 6 September 2006. Pictured here, seated in front , from left to right are: Joana Merlin-Scholtes, UN Resident Coordinator in Thailand, Zhang Wanhai, Minister Counselor and Permanent Representative of the People’s Republic of China to UNESCAP, H.E. Nguyen Duy Hung, the Ambassador of Vietnam, Souvanna Phouyavong, Minister-Counsellor of Lao PDR, Deputy Permanent Representative to UNESCAP, Myint Soe Minister Counselor of Myanmar, and Rarintip Sirorat, Director of Bureau of Policy and Strategy, National Operation Center on Prevention and Suppression of Human Trafficking (NOCHT).